Is a human-made breed natural because we're natural? We often forget that we're natural creatures ourselves on this planet. So could we really say that (be it the first cloned sheep, a customized pet, or trying to make a super-horse for racing or a super-cow for beef) the moment humanity creates something that normally has to evolve to change, that thing's existence is just as earned as the billion-year-evolved qualities of everything outside of society? It DID fill a need. We were curious, greedy or angry enough to say 'see, it is possible' and make it happen. Re: Is a human-made breed natural because we're natural? Not so much a question of evolution or biology as a whole, more one of morality and ethics. Yes we are a part of nature, though we tend to set ourselves above and beyond it. Are we (humans) capable of predetermining the course of evolution? I very much doubt it. When we do something which alters the course of evolution, such as selective breeding of dogs and horses or when we hybridise a plant, we tend to look at the goal we wish to achieve, taking little or no account for the knock-on effect on that or other species. In other words, the alterations we make are intended for our benefit. It is also the case that these alterations tend to be quite radical and fast. By contrast, natural changes tend to be subtle and over long periods, so that related, linked or dependant species can adapt at the same time. But if there were, no spreadsheet on Earth would be big enough for the millions upon millions of related alterations to each and every species on Earth, for one small alteration to one species. In the whole picture, all species are interlinked directly or indirectly through 3rd 4th 5th parties. Dogs are a perfect example of how our interference can cause problems. Thoroughbreds, pretty much, all have one or a combination of troubles with breathing, sight, ear infections, weight to muscle ratios, arthritis, heart troubles etc. Some dogs even have trouble eating. These adaptations are hardly the path nature would have taken. When you mentioned dogs finding it hard to eat, it reminded me of Old English Sheepdogs and how they always have their fur in their eyes. WHAT?! JUST, WHAT?! 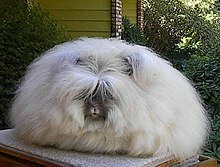 Angora rabbit. What have we done?! Nature made an ape that eventually made THIS thing. Oh my lack of belief. I just thought of something. Can you imagine if humanity's footprint becomes so dominant on this planet that nothing is 'pure-natural' anymore? Where everything has been tampered with by humans like this? Would we even call it nature then?? Anything created as modification by humans probably would be natural , the only moral question(clause of do such) would be is it required and is it able to subsist with its special abilities. A problem i have always mused about Canis Familiaris(Domestic Dog) and Canis Lupus(Wolf). C.F. is 300,000 years apparently, and C.L. is one million for the present version and 4 million in total as any form of wolf. However, C.F. is not as efficient in its bigger breeds as wolves smaller than them. Until the behavior and size reaches around 40Kg of C.F. it cannot use enough different modes of hunting and prey types in the wild. Keeping wolves is difficult in domestic situations because they bite their owner as a method of talking and can be downright disagreeable. Familiaris selection is alike an "old favorite worker" in a warehouse, nothing but a hazard by its own lack of ability and uneconomic until it is used just-so as to what it can do if it will. By the theory that any animal that humans "create" is natural. Then so is everything else that we create. This computer that I'm typing on. You could, of course, argue that fission and fusion follow the basic laws of physics. Perhaps one would consider selective breeding as both "natural" and "artificial". Genetic Modification (GM) usually is merely enhancing nature. Anyway, I would agree with Don that it is often a useful distinction to consider what would the natural environment have been like without humans, and what is growing with the intervention of humans (which are often short-sighted). Just because a human ‘designed’ animal or plant may fit a niche and may be able to exist thenceforth, does not mean it will not have consequences for other species. What’s more, that ‘niche’ will be one that man has decided exists, not nature. Nature does not take a gene from one species and insert it into the genetic structure of another. It is we humans who have put ourselves above, beyond and apart from nature. We can't just opt back in when it suit's us. This stuff is science fiction GOLD, man. The shocking part is that it's actually nonfiction at this point. Not a radical point because of where radioactive isotopes are come from. ....and the unfairly disadvantaged ones in their bellies! From the wolves(Canis Lupus): AMEN TO THAT ONE BRO!!! ...What’s more, that ‘niche’ will be one that man has decided exists, not nature. Or replacing extinction from modern mans violent attack on the geography and their habitats. I read somewhere that some strains of bacteria do that very thing. This doesn't by any means detract from your overall point, but I just wanted to point it out as I find it fascinating that bacteria are capable of that. Bacteria can transmit plasmids from one to another, as well as "sampling" environmental genetic material. They wouldn't necessarily know what the genetic material is supposed to do. Thus, no "intelligent design". But, something like drug resistance can potentially cross species through the use of plasmids. I'm not sure what the control mechanisms are, so if an individual bacterium picks up bad genetic material, can it turn it off, or is it potentially lethal to that bacterium, and thus not passed on. This is one of the concerns about having both vancomycin resistant enterococci (VRE) and methicillin resistant staph aureus (MRSA) in the same host. There is a theoretical risk that they could share genes to make a new class of very hard to kill super-bug. This was discussed a decade ago, has it happened yet? The goal of viruses and phages, of course, is to insert their own genetic material into a host, and thus modifying the host to suit their own needs. "To Err is Human"....why ? Why Are Piggys Organs Like Human Organs ? Do you think human immortality is possible, given biological immortality? Page created in 0.156 seconds with 69 queries.